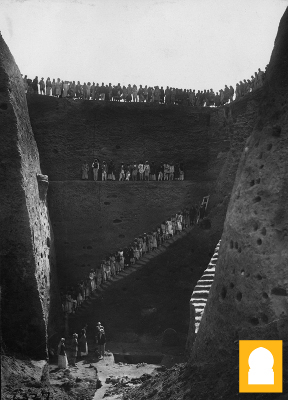 The Ur site was excavated by C. Leonard Woolley and his team contained about 1800 burials. Woolley classified 16 of these as “royal” based on their distinctive form, their wealth, and the fact that they contained burials of servants and other high-ranking personages along with the “royal” person. The royal cemetery tomb of Queen Puabi, like the tomb of King Tutankhamun, was an especially extraordinary find for being intact, having escaped looting through the millennia. The tomb featured a vaulted chamber set at the bottom of a deep “death pit”; the lady was buried lying on a wooden bier. 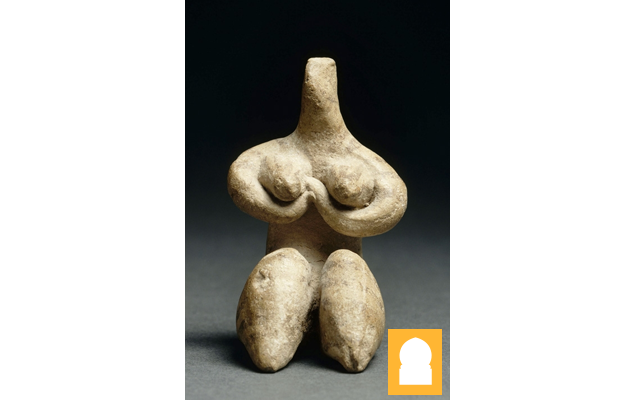 She was identified by a cylinder seal bearing her name that was found on her body. The seal is carved in cuneiform and written in Sumerian, the world’s first written language. Queen Puabi wore an elaborate headdress of gold leaves, gold ribbons, strands of lapis lazuli and carnelian beads, a tall comb of gold, chokers, necklaces, and a pair of large, crescent-shaped earrings. Her upper body was covered in strings of beads made of precious metals and semi-precious stones stretching from her shoulders to her belt, while rings decorated all her fingers. An ornate diadem of thousands of small lapis lazuli beads with gold pendants of animals and plants was on a table near her head. Two attendants were buried in the chamber with her; one crouched at her head, the other at her feet. 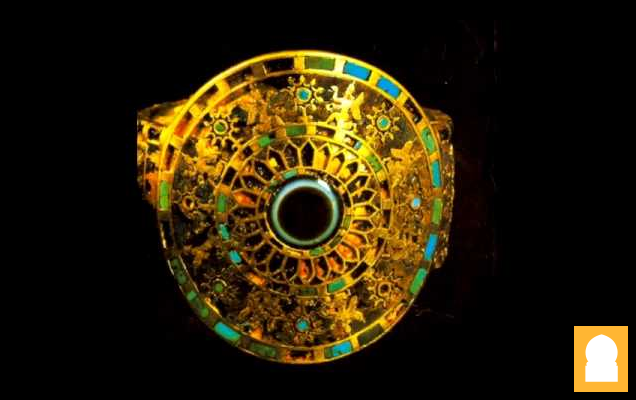 Much of the jewelry from Queen Puabi, including the diadem, is on view in the traveling exhibition. In a pit associated with Queen Puabi’s chamber were five armed men, a wooden sled drawn by a pair of oxen, four grooms for the oxen, and a wood chest or wardrobe which probably contained textiles, long since decomposed. Three more attendants crouched near the wardrobe, surrounded by metal, stone, and clay vessels. At the opposite end of the pit were twelve female attendants, all wearing a less elaborate version of Queen Puabi’s headdress. Many more artifacts, now world-famous in the fields of art, history, and archaeology, were found by Woolley in the larger cemetery. The University of Pennsylvania Museum collection includes one of the world’s earliest known musical instruments—a large wooden lyre (reconstructed from the exacting measurements made by the original excavators) with the original gold and lapis lazuli bull’s head and inlaid plaque depicting mythical animals drinking and performing. The Ur treasures—divided in the 1920s and 1930s among the University of Pennsylvania Museum in Philadelphia, the British Museum in London, and the Iraq Museum in Baghdad—never again traveled, until now. The Philadelphia collection—which has been on display at the University of Pennsylvania Museum—will visit eight sites around the United States before its permanent reinstallation at that museum in 2001. Extravagant jewelry of gold, lapis lazuli, and carnelian, cups of gold and silver, bowls of alabaster, and extraordinary objects of art and culture were among the Mesopotamian treasures uncovered in the late 1920s by renowned British archaeologist C. Leonard Woolley in a joint expedition by the British Museum and the University of Pennsylvania Museum. 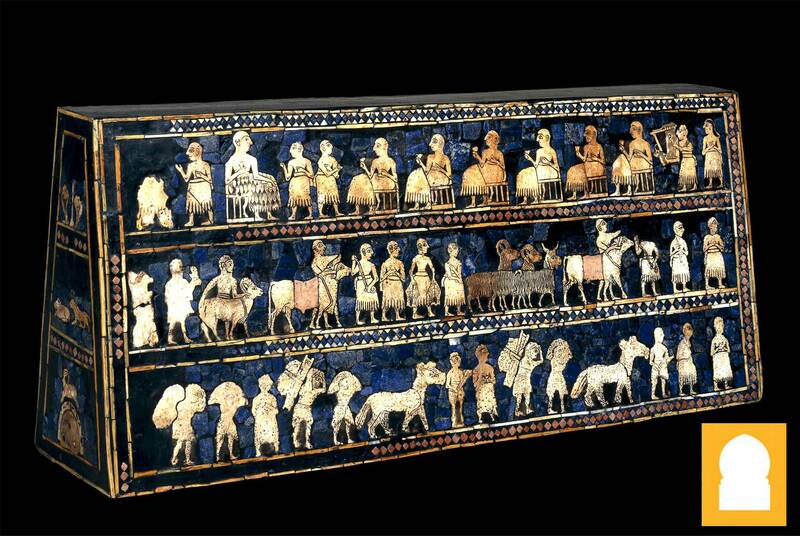 One of the most spectacular discoveries in ancient Mesopotamia (modern day Iraq), the royal tombs at Ur opened the world’s eyes to the full glory of ancient Sumerian culture (2600–2500 BC) at its zenith. Among C. Leonard Woolley’s discoveries at Ur were thick layers of water-laid clay found beneath Ur and dating back to between 4,000 and 3,000 BC. Woolley declared this find to be evidence of the “Great Flood” recorded in Mesopotamian narratives and in the Book of Genesis. By special arrangement with the University of Pennsylvania Museum of Archaeology and Anthropology, the McClung Museum is also featuring an additional display case presenting Woolley’s discovery of these deeply buried flood deposits. Included in the exhibit are samples of the “Flood Mud” discovered beneath Ur, and the Nippur Tablet, a clay tablet from ancient Nippur which is the only surviving document of the Sumerian flood story. Dating from the seventeenth century BC, the tablet contains six columns of text, three per side, with ten to fifteen lines in each column. Written in Sumerian, it not only tells the flood story, but also describes the creation of humans and animals, and records the names of antediluvian cities and their rulers. Archaeologists and language specialists today doubt that the Ur (or Kish) floods could be the source of the Mesopotamian flood narratives. Instead, they view the discovered flood deposits merely as evidence that flooding was a persistent hazard in the flat alluvial plain of southern Mesopotamia. 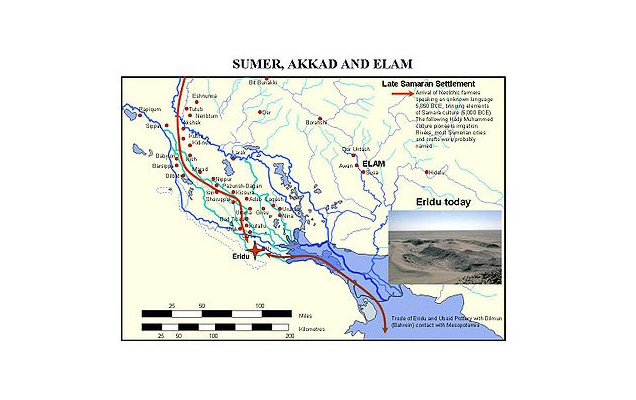 On the other hand, many scholars believe that the Mesopotamian flood tradition was reshaped by Hebrew writers of the eighth and sixth centuries BC into the biblical account of Noah and the Great Deluge found in the Book of Genesis. There is no archaeological evidence that the house of Ibrahim however located about few hundred meters from the ziggurat of UR belongs to the biblical profit Ibrahim. More recently the name Ibramo was found engraved on a couple of clay bricks, due to this discovery it is now referred to as the house of the profit Ibrahim. Alexander Polyhistor, which in turn quotes a passage in Concerning the Jews of Assyria by the second century BCE historian Eupolemus, which claimed that Abraham was born in the Babylonian city Camarina, which it notes was also called "Uria". (Such indirect quotations of Eupolemus via Polyhistor are referred to as Pseudo-Eupolemus.) This site is identified with the Sumerian city of Ur located at Tell el-Mukayyar, which in ancient texts was named Uriwa or Urima. Ur was the sacred city of the moon god and the name "Camarina" is thought to be related to the Arabic word for moon qamar, although Camarina is in fact the name of an ancient city in Sicily. The identification with Ur Kaśdim accords with the view that Abraham's ancestors may have been moon-worshippers, an idea based on the possibility that the name of Abraham's father Terah is related to the Hebrew root for moon (y-r-h). Jewish tradition relates however that Terah worshipped many gods and the argument along this line remains weak. Ur lay on the boundary of the region called Kaldu (Chaldea, corresponding to Hebrew Kaśdim) in the first millennium BCE and the site remains the most popular identification of Ur Kaśdim amongst scholars. In Sumerian mythology, it was said to be one of the five cities built before the Deluge occurred. Eridu appears to be the earliest settlement in the region, founded ca. 5400 BC, close to the Persian Gulf near the mouth of the Euphrates River. Because of accumulation of silt at the shoreline over the millennia, the remains of Eridu are now some distance from the gulf at Abu Shahrain in Iraq. According to Gwendolyn Leick, Eridu was formed at the confluence of three separate ecosystems, supporting three distinct lifestyles, that came to an agreement about access to fresh water in a desert environment. The oldest agrarian settlement seems to have been based upon intensive subsistence irrigation agriculture derived from the Samarra culture to the north, characterised by the building of canals, and mud-brick buildings. The fisher-hunter cultures of the Arabian littoral were responsible for the extensive middens along the Arabian shoreline, and may have been the original Sumerians. They seem to have dwelt in reed huts. The third culture that contributed to the building of Eridu was the nomadic Semitic pastoralists of herds of sheep and goats living in tents in semi-desert areas. All three cultures seem implicated in the earliest levels of the city. The urban settlement was centered on an impressive temple complex built of mudbrick, within a small depression that allowed water to accumulate. Kate Fielden reports The earliest village settlement (c.5000 BC) had grown into a substantial city of mudbrick and reed houses by c.2900 BC, covering 8-10 ha (20-25 acres). By c.2050 BC the city had declined; there is little evidence of occupation after that date. Eighteen superimposed mudbrick temples at the site underlie the unfinished Ziggurat of Amar-Sin (c.2047â€“2039 BC). The finding of extensive deposits of fishbones associated with the earliest levels also shows a continuity of the Abzu cult associated later with Enki and Ea. This apparent continuity of occupation and religious observance at Eridu provide convincing evidence for the indigenous origin of Sumerian civilization.Eridu was abandoned for long periods, before it was finally deserted and allowed to fall into ruin in the 6th century BCE. The encroachment of neighbouring sand dunes, and the rise of a saline water table, set early limits to its agricultural base so in its later Neo-Babylonian development, Eridu was rebuilt as a purely temple site, in honour of its earliest history. E-abzu temple of EriduThe site at Tell abu Shahrain, near Basra, was initially excavated by J. E. Taylor in 1855, R. Campbell Thompson in 1918, and H.R. Hall in 1919. Seton Lloyd of the Iraqi Directorate General of Antiquities and Heritage. These archaeological investigations showed that, according to Oppenheim, "eventually the entire south lapsed into stagnation, abandoning the political initiative to the rulers of the northern cities," and the city was abandoned in 600 BC. Excavation there resumed from 1946 to 1949 under Fuad Safar and One recent school of thought, following David Rohl, has conjectured that Eridu, to the south of Ur, was the original Babel and site of the Tower of Babel, rather than the later city of Babylon, for a variety of reasons: The ziggurat ruins of Eridu are far larger and older than any others, and seem to best match the Biblical description of the unfinished Tower of Babel.One name of Eridu in cuneiform logograms was pronounced NUN.KI (the Mighty Place) in Sumerian, but much later the same NUN.KI was understood to mean the city of Babylon.The much later Greek version of the King-list by Berosus (c. 200 BC) reads "Babylon" in place of "Eridu" in the earlier versions, as the name of the oldest city where "the kingship was lowered from Heaven". 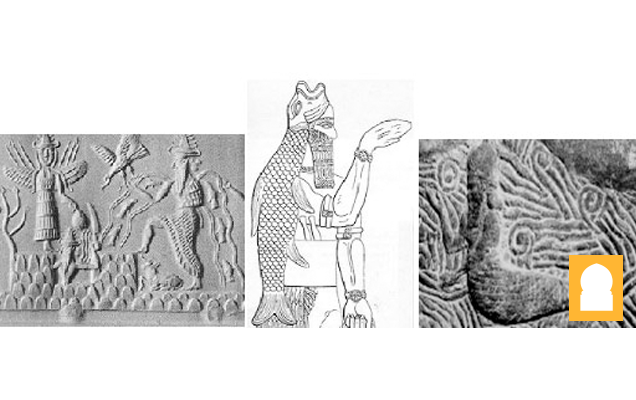 The fish man (Oannes)Berossus told us first how a mysterious creature called Oannes -half fish, half man- came from the sea and showed mankind writing, farming and the arts. Salah ad-Din Governorate. On the east bank of the Tigris, about 11 kilometers south of Samarra. 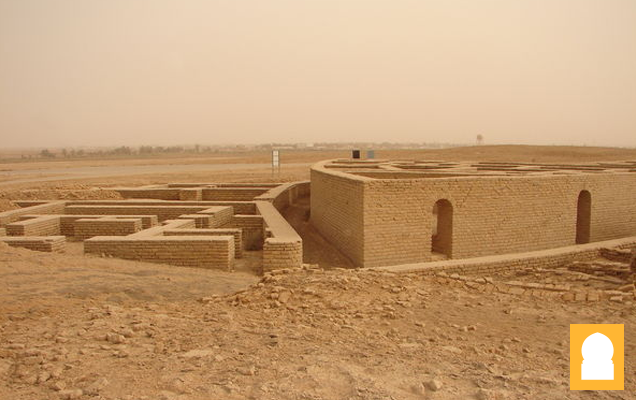 Kish or Uhaimir ("the red" - because of its ziggurat's red bricks), was one of the twelve city-states of ancient Sumer civilization, located on an ancient branch of the Euphrates river 10 km east of Babylon. In this city lived the famous and magnificent Akkadian King Sargon of Agade, founder of the very first Empire in history. In the history of Mesopotamia, Kish was the center of the 1st dynasty reigned after the great Flood. Schedules of the Sumerian kings indicates that the kingship, after the Flood, descended from heaven again to Kish, and not as previously to Eridu near Ur. One of the earlier kings in Kish was Etana who "stabilized all the lands" securing the 1st dynasty of Kish and establishing rule over ancient Sumer and some of its neighbors. IImportant remains still standing at Kish include the city's red-bricks ziggurat built perhaps by Nebuchadnezzar II (604-562 BC) on a rectangular base measuring 58x55 m, the grand palace, and two ziggurats, one probably dedicated to Inanna the Sumerian goddess of love of the 6th century BC, and both constructed from convex flat bricks with a grand desk. The front of this desk comprises several entrances in addition to a group of houses. 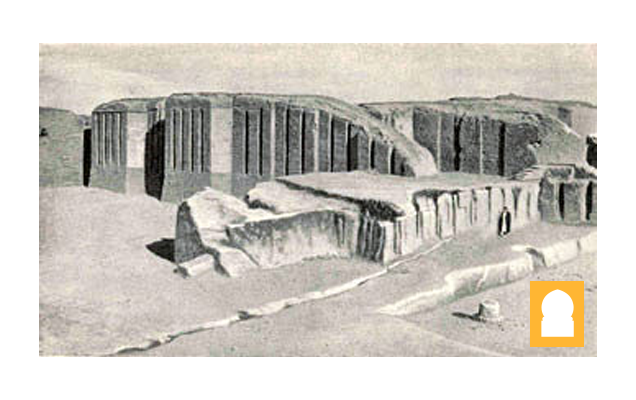 The ancient site of Nimrud was first investigated from 1845 to 1851 by Henry Austen Layard (later Sir Austen Henry Layard), who regarded the site as a district of a supposed "Nineveh" urban region (hence the name of Nineveh in the titles of several early works about Nimrud; Layard did not misidentify the site as Nineveh as has often been supposed). His books Nineveh And Its Remains [Abridged and Titled Discoveries at Nineveh] and "Monuments of Nineveh" refer to this site. Subsequent major excavations were headed by Hormuzd Rassam (1853â€“54 and 1877â€“79), W.K. Loftus (1854â€“55), George Smith (1873), Max Mallowan (1949â€“57), David Oates (1958â€“62), Julian Orchard (1963), the Directorate of Antiquities of the Republic of Iraq (1956, 1959â€“60, 1969â€“78 and 1982â€“92), Janusz Meuzynski (1974â€“76), Poalo Fiorina (1987â€“89), and John Curtis (1989). Excavations revealed remarkable bas-reliefs, ivories, and sculptures. A statue of Ashurnasirpal II was found in an excellent state of preservation, as were colossal winged man-headed lions weighing 10 short tons (9.1 t) to 30 short tons (27 t)each guarding the palace entrance. The large number of inscriptions dealing with king Ashurnasirpal II provide more details about him and his reign than are known for any other ruler of this epoch. Portions of the site have been also been identified as temples to Ninurta and Enlil, a building assigned to Nabu, the god of writing and the arts, and as extensive fortifications. The palaces of Ashurnasirpal II, Shalmaneser III, and Tiglath-Pileser III have been located. The famous Black Obelisk of Shalmaneser III was discovered by Layard in 1846. The monument stands six-and-a-half-feet tall and commemorates the king's victorious campaigns of 859â€“824 BC. It is shaped like a temple tower at the top, ending in three steps. On one panel, Israelites led by king Jehu of Israel pay tribute and bow in the dust before king Shalmaneser III, who is making a libation to his god. The cuneiform text on the obelisk reads "Jehu the son of Omri", and mentions gifts of gold, silver, lead, and spear shafts. 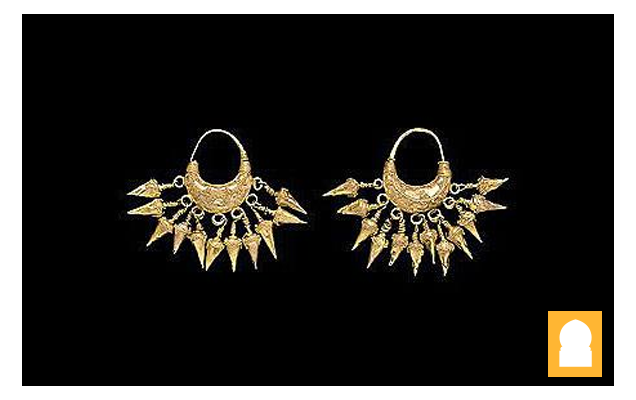 The "Treasure of Nimrud" unearthed in these excavations is a collection of 613 pieces of gold jewelry and precious stones. It has survived the confusions and looting after the invasion of Iraq in 2003 in a bank vault, where it had been put away for 12 years and was "rediscovered" on June 5, 2003. Colossal statues moved to London In 1847 after discovering more than half a dozen winged pair of colossal statues of lions and bulls also known as lamassu weighing up to 30 short tons (27 t) Henry Layard brought two of the colossi weighing 10 short tons (9.1 t) each including one lion and one bull to London. After 18 months and several near disasters he succeeded in bringing them to a British museum. This involved loading them onto a wheeled cart. They were lowered with a complex system of pulleys and levers operated by dozens of men. The cart was towed by 300 men. He initially tried to hook the cart up to a team of buffalo and have them haul it. However the buffalo refused to move. Then they were loaded onto a barge which required 600 goatskins and sheepskins to keep it afloat. After arriving in London a ramp was built to haul them up the steps and into the museum on rollers.Additional 30 short tons (27 t) colossi were transported to Paris from Khorsabad by Paul Emile Botta in 1853. In 1928 Edward Chiera also transported a 40-short-ton (36 t) Colossus from Khorsabad to Chicago. The Nimrud lens is a 3000 year old piece of rock crystal, which was unearthed by Austen Henry Layard at the Assyrian palace of Nimrud. It may have been used as a magnifying glass, or as a burning-glass to start fires by concentrating sunlight. Assyrian craftsmen made intricate engravings, and could have used such a lens in their work. Italian scientist Giovanni Pettinato of the University of Rome has proposed that the lens was used by the ancient Assyrians as part of a telescope.This would explain why the ancient Assyrians knew so much about astronomy (see Babylonian astronomy). Experts on Assyrian archaeology are unconvinced, doubting that the optical quality of the lens is sufficient to be of much use. The ancient Assyrians saw the planet Saturn as a god surrounded by a ring of serpents, which Pettinato suggests was their interpretation of Saturn's rings as seen through a telescope.Other experts say that serpents occur frequently in Assyrian mythology, and note that there is no mention of a telescope in any of the many surviving Assyrian astronomical writings. The Nimrud lens is on display in the British Museum. Join Iraq Heritage now and be part of our big family.